Providence – State Senator and Deputy Minority Leader Dawson Hodgson (R-Dist. 35) appeared before the State Properties Committee (SPC) on Wednesday, joining several constituents and resident opponents to the Deepwater Wind offshore wind demonstration project protesting the company’s request for easements over state lands and highways. Hodgson after listening to presentations to the committee by representatives from the Rhode Island Department of Transportation (RIDOT) and Department of Environmental Management (DEM), urged the SPC to stand up and stop what he believed to be a “terrible deal for the people of RI.” Hodgson asked the committee to deny utility easements and assignments to Deepwater Wind Transmission LLC (Deepwater Wind) and Narragansett Electric Company, for passage of its subterranean and terrestrial transmission cables through state properties at Scarborough State Beach and Dillon’s Corner in Narragansett. The transmission cable, needed to tie Block Island to mainland electricity, linking mainland and island with a five-turbine offshore wind farm demonstration project, were originally planned for landing at Narragansett Town Beach. After much deliberation and exhaustive public hearings on the town property landing site, Deepwater Wind withdrew it’s application in light of heavy resident opposition, ending negotiations with the Town of Narragansett. The Town Council, posthumously and in a unanimous vote denied the application. Hodgson accredited his opposition to several points, two of which were repeated by resistance members throughout the public commentary period. The Senator pointed out that ratepayer increases not only affect his constituency, but have broad-reaching capabilities statewide, as well as in the overall scheme of renewable energy stewardship and responsibility. While the original enabling legislation passed by the General Assembly drew bi-partisan support, the economic impact to the state brought parallel opposition. Joining Hodgson at the table was former Attorney General James O’Neil, a Narragansett resident who has opposed the project from its inception. 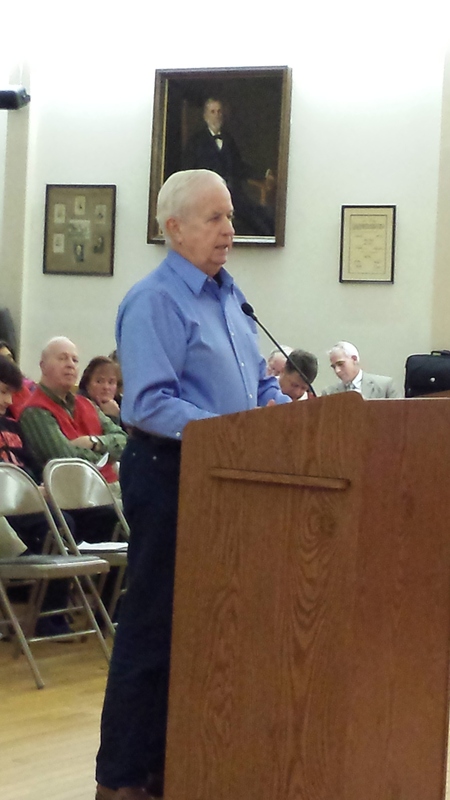 O’Neil, too, reminded the committee that residents of Narragansett did not want Deepwater’s transmission cable in town and put forth the economic factors of the project born by taxpayers and ratepayers alike. “You always hear this term put forth,’it’s no impact on the taxpayer.’ It’s going to be an impact on the ratepayer. What about the ratepayers? Every nickel that goes into this, with the exception of this $1 million fund, is born by the ratepayers -on the backs of the ratepayers,” he said. 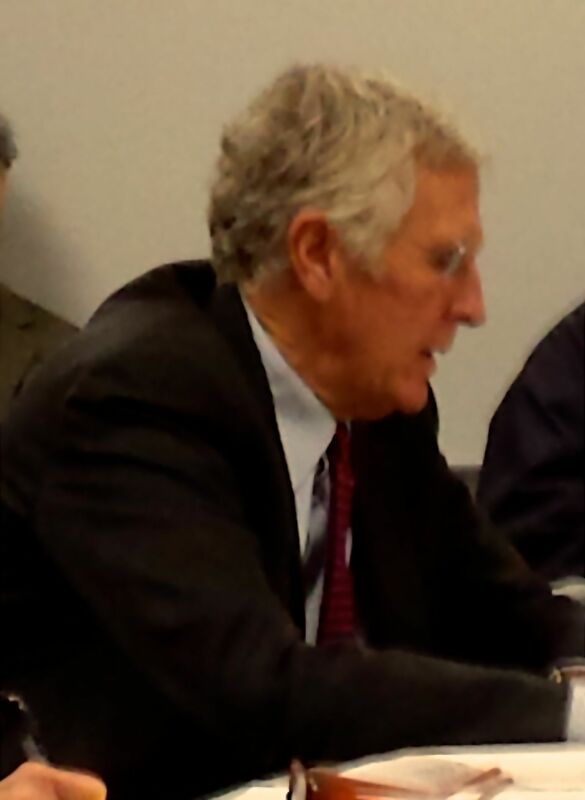 Former Attorney General James O’Neil urges the SPC to deny Deepwater Wind utility easement applications. O’Neil painted a picture of a deal beneficial to the Deepwater Wind entity alone, set up on a business timeline for the purposes of supporting business needs, with no consideration for residents and taxpayers. “This case is all about investment tax credits. If you don’t expend a certain percentage of the overall project funds by the end of this calendar year, you will lose the opportunity to weigh in on those investment tax credits. Especially with the $207 million project, it could be about $60 million to the developer,” he said. “They have the right to do that. The Congress of the United States has said it, but the Congress of the United States may not renew those credits. Calling attention to the easement agreement for the Scarborough Beach landing, O’Neil , once the state’s highest ranking attorney, raised a possible legal gaff with the granting of passage by SPC. Referring to language in the agreement that allows the contractor to remove and cut trees and brush at the construction site, O’Neil questioned the committee, deferring also to DEM legal counsel, Mary Kay, as to how the agreement could be made without first having consent from the State Coastal Resources Management Council (CRMC). Seen as the potential “cart before the horse,” any decision by SPC also required an affirmative decision from CRMC on the Scarborough Beach Alternative site prior to commencement of work. A conundrum of sorts, CRMC approval would be mute without approved easements for the siting. Also questioned by O’Neil was the absence of representatives from Narragansett Electric Company or National Grid in a hearing where the easements in question were to be assumed by the energy companies in perpetuity. “The grantee here is going to end up being National Grid also known as Narragansett Electric. I don’t know why we go through the charade of not having them at the table here. I don’t know why we go through the charade of not saying they are seeking the easement,” said O’Neil. Not to be denied a voice, a group of Narragansett residents and their newly formed political action committee (PAC), the Deepwater Resistance PAC spoke through Gerry McCarthy, Vice-Chairman. McCarthy further noted that the economic viability of the entire project was in question and asked that the committee consider separating the issues of the Deepwater Wind cable and how to bring power to Block Island. Regarding the Deepwater Wind Alternative Landing Site, McCarthy took a 360 degree turn from the PAC’s stance on the state’s input into Town affairs. Although the PAC was reticent to have the state involved in Town business, McCarthy didn’t feel the Town should be omitted from State decisions. Holding the line on opposition position to review the project in total, attorney and Narragansett Town Council member, Matthew Mannix provided insight into the process leading to Deepwater Wind’s withdrawal of application for landing at Town Beach. “What I urge you as a board to look at, is not to look at it narrowly. Because if we had done that in Narragansett we would have said we’re not going to look at the merits of this project. [When] people started to know what was going on with this project, it was overwhelming opposition and it was well researched, well thought-out opposition,” he said. Mannix revisited the issue of PUC hearings that had Deepwater Wind’s first attempt at securing the wind farm project rejected. Explaining the circumstances leading up to the General Assembly’s enabling legislation, Mannix cautioned the SPC about the increase in costs to the state ratepayers. “People went back to the PUC dockets which is where this was rejected the first time. PUC- 4111, the increase in energy rates on the mainland was above 300 million. As you know, you’ve heard, that figure has gone up since then because that was several years ago,” he said. Mannix went on to slam the action of the General Assembly in creating a proponent for passage. Answering a question posed by Ronald Renaud, SPC Chair, Mannix made it clear that it was his personal opinion that residents of the Town of Narragansett did not want the transmission cable. “The minutes of the meeting would reflect no entry on Town property,” said Mannix, freshman Council member. The board voted 2-0, with one abstention to allow the easements on all properties proposed. The State Department of Environmental Management has scheduled a public hearing on modifications to the Deepwater Wind Offshore Energy and Transmission Project to be held Wednesday, December 11 at 6:00 p.m. at Narragansett Town Hall. The hearing will specifically address modifications to a State of Rhode Island Dredge Permit and Water Quality Certificate Application previously filed by Deepwater Wind (DWW) in anticipation of it’s landing site at Narragansett Town Beach.